South Australia (S.A.) has a land area of 984,221 square km, of which about 4,600 square km are located on islands. South Australia has a coastline of 5,067 km which consists of 3,816 km of mainland coastline and 1,251 km of island coastline. South Australia’s land area is 12.7% of Australia’s total, with the state being the fourth largest of all the Australian States and Territories. The state’s coastal waters cover about 60,032 square km. To put that into perspective, South Australia is larger than any country in Europe, excluding Russia. Ukraine comes the closest at 603,700 km², then France 547,030 km², and then Spain at 505,992 km². Italy could be placed into South Australia, more than three times over, whilst the whole of the United Kingdom could be placed into South Australia four times over. 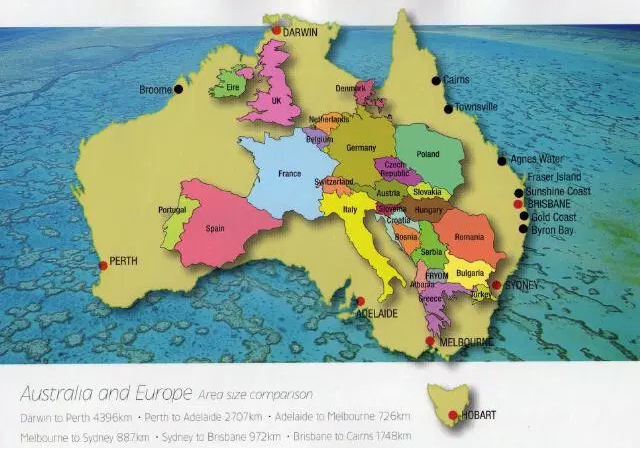 Although I couldn’t find an overlay map of South Australia, here is one of Australia showing how big Australia is compared to most of mainland Europe…..
Mount Woodroofe is South Australia’s highest peak at 1,435 metres above sea level. It is a big 10 pointer for the Summits on the Air (SOTA) program, too by the way. South Australia is a relatively flat place, with more than 80% of South Australia being less than 300 metres above sea level. The lowest place is Lake Eyre at 15 metres below sea level. It is in this vicinity that South Australia receives its lowest rainfall. About 52,786 square km is occupied by agriculture, which equates to 53.6% of the State. South Australia’s parks and reserves are managed by the Department of Environment, Water and Natural Resources (DEWNR). DEWNR was created on 1st July 2012 to bring together environment and natural resources management in South Australia. The new Department was created by amalgamating the Department for Water, and the Department of Environment and Natural Resources. DEWNR are responsible for establishing and managing South Australia’s parks. There are a total of 350 parks and reserves covering an area of 21,087,984 hectares, which equates to 21.5% of South Australia. 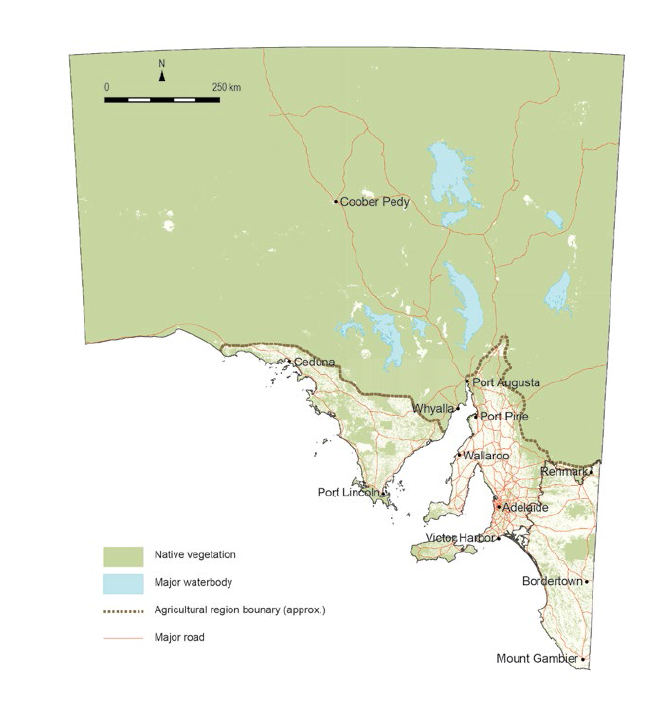 The map below shows the extent of South Australia’s vegetation.